Epson Dual Laser with Phosphor Video Projector Light Engine. Video projectors bring the movie-going experience home with the ability to display images that are much larger than most TVs can provide. However, in order for a video projector to perform at its best, it has to provide an image that is both bright and displays an extensive color range. To accomplish this task, a powerful built-in light source is needed. Over the past several decades, different light source technologies have been employed, with Laser being the latest to enter the arena. Let's take a look at the evolution of light source tech used in video projectors and how Lasers are changing the game. Video Projectors - CRT (top) vs Lamp (bottom). In the beginning, video projectors and projection TVs employed CRT technology (think very small TV picture tubes). Three tubes (red, green, blue) supplied both the needed light and image detail. Each tube projected onto a screen independently. In order to display a full range of colors, the tubes had to be converged. This meant that the color mixing actually took place right on the screen and not inside the projector. The problem with tubes is not only the need for convergence to preserve the integrity of the projected image if one tube faded or failed prematurely, all three tubes had to be replaced so that they all projected color at the same intensity. The tubes also ran very hot and needed to be cooled by special "gels" or "liquid". To top it off, both CRT projectors and projection TVs consumed a lot of power. Functional CRT-based projectors are now very rare. Tubes have since been replaced with lamps, combined with special mirrors or color wheel that separates the light into red, green, and blue, and a separate "imaging chip" that provides the image detail. Depending on the type of imaging chip used (LCD, LCOS, DLP), the light coming from the lamp, mirrors, or color wheel, has to pass through or reflect off of the imaging chip, which produces the picture you see on the screen. LCD/LCOS and DLP "lamp-with-chip" projectors are a big leap from their CRT-based predecessors, especially in the amount of light they can put out. However, lamps still waste a lot of energy outputting the entire light spectrum, even though only the primary colors of red, green, and blue are actually needed. Although not as bad as CRTs, lamps still consume a lot of power and generate heat, necessitating the use of a potentially noisy fan to keep things cool. Also, from the first time you turn on a video projector, the lamp starts to fade and will eventually be too dim or burn out (usually after 3,000 to 5,000 hours). Even CRT projection tubes, as big and cumbersome as they were, lasted a lot longer. The short lifespan of lamps necessitates periodic replacement at added cost. Today's demand for eco-friendly products (many projector lamps also contain Mercury), necessitates an alternative that can do the job better. Video Projector LED Light Source - Generic Example. One alternative to lamps: LEDs (Light Emitting Diodes). LEDs are much smaller than a lamp and can be assigned to emit just one color (red, green, or blue). With their smaller size, projectors can be made much more compact - even inside something as small as a smartphone. LEDs are also more efficient than lamps, but they still have a couple of weaknesses. First, LEDs are not as bright as lamps (comparing an LED vs lamp projector in the same price range). Second, LEDs do not emit light coherently. This means is that as the light beams leave an LED chip-based light source, they have a tendency to slightly scatter, meaning that, although they are more precise than a lamp, they are still slightly inefficient. One example of a video projector that employs LEDs for its light source is the LG PF1500W. Mitsubishi LaserVue DLP Rear-Projection TV Example. To solve the problems of lamps or LEDs, a Laser light source can be used. Lasers have been in use since about 1960 as tools in medical surgery (such as LASIK), in education and business in the form of laser pointers and distance surveying, and the military uses lasers in guidance systems, and as possible weapons. Also, Laserdisc, DVD, Blu-ray, Ultra HD Blu-ray, or CD player, use lasers to read pits on a disc that contains music or video content. When used as a video projector light source, Lasers provide several advantages over lamps and LEDs. Lasers solve the light scattering problem by emitting light coherently. As the light exits the laser as a single, tight, beam, whose "thickness" is retained over distance unless changed by passing through additional lenses. Lower Power Consumption. Due to the need to provide enough light for the projector to display an image on a screen, a lamp consumes a lot of power. However, since each Laser only needs to produce one color (similar to an LED), it is more efficient. Increased Light Output with less heat generation—especially important for HDR, which requires high brightness for full effect. Provides support for wider color gamut and more precise color saturation. Virtually Instant On/Off time—more like what you experience when turning a TV on and off. Longer useful source life—20,000 use hours or more is easily attainable, eliminating the need for periodic lamp replacement. 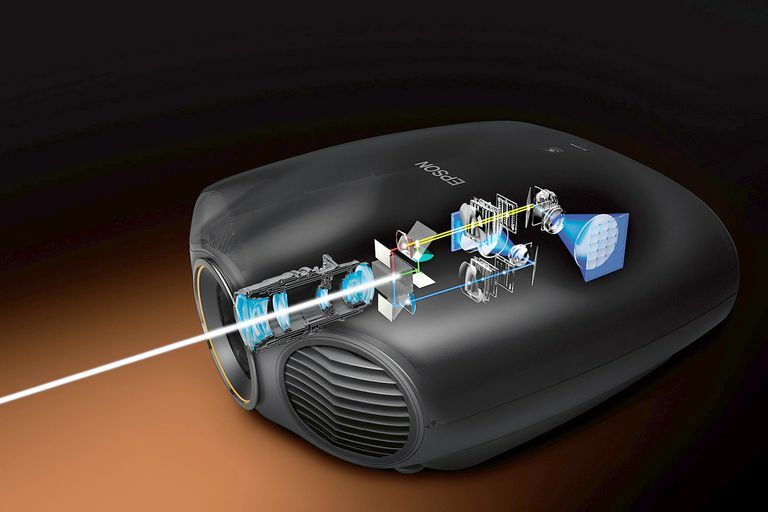 Mitsubishi was the first to use lasers in a consumer video projector-based product. In 2008, they introduced the LaserVue rear-projection TV. The LaserVue used a DLP-based projection system in combination with a laser light source. Unfortunately, Mitsubishi discontinued all their rear-projection TVs (including the LaserVue) in late 2012. The LaserVue TV employed three lasers, one each for red, green, and blue. The three colored light beams were then reflected off a DLP DMD chip, which contained the image detail. The resultant images were then displayed on the screen. LaserVue TVs provided excellent light output capability, color accuracy, and contrast. However, they were very expensive (a 65-inch set was priced at $7,000) and although slimmer than most rear-projection TVs, was still bulkier than Plasma and LCD TVs available at the time. DLP Laser Video Projector Light Engines - RGB (left), Laser/Phosphor (right) - Generic Examples. The above images and following descriptions are generic —there may be slight variations depending on manufacturer or application. Although LaserVue TVs are no longer available, Lasers have been adapted for use as a light source for traditional video projectors in several configurations. RGB Laser (DLP)—This configuration is similar to that used in the Mitsubishi LaserVue TV. There are 3 lasers, one that emits red light, one green, and one blue. The red, green, and blue light travels through a de-speckler, a narrow "light pipe" and lens/prism/DMD Chip assembly, and out of the projector onto a screen. RGB Laser (LCD/LCOS)—Just as with DLP, there are 3 lasers, except that instead reflecting off DMD chips, the three RGB light beams are either passed through three LCD Chips or reflected off 3 LCOS chips (each chip is assigned to red, green, and blue) to produce the image. Although the 3 laser system is currently used in some commercial cinema projectors, due to its cost, is not currently used in consumer-based DLP or LCD/LCOS projectors—but there is another, lower cost alternative that is becoming popular for use in projectors—the Laser/Phosphor system. Laser/Phosphor (DLP)—This system is a little more complicated in terms of required number of lenses and mirrors needed to project a completed image, but by reducing the number of Lasers from 3 down to 1, cost of implementation is greatly reduced. In this system, a single Laser emits blue light. The blue light is then split in two. One beam continues through the rest of the DLP light engine, while the other strikes a rotating wheel that contains green and yellow phosphors, which, in turn, create two green and yellow light beams. These added light beams, join the untouched blue light beam, and all three pass through the main DLP color wheel, a lens/prism assembly, and reflected off the DMD chip, which adds the image information to the color mix. The complete color image is sent from the projector to a screen. One DLP projector that employs the Laser/Phosphor option is the Viewsonic LS820. Laser/Phosphor (LCD/LCOS)—For LCD/LCOS projectors, incorporating a Laser/Phosphor light system is similar to that of DLP projectors, except that instead of using a DLP DMD chip/Color Wheel assembly, the light is either passed through 3 LCD chips or reflected off of 3 LCOS chips (one each for red, green, and blue). However, Epson employs a variation that employs 2 lasers, both of which emit blue light. As the blue light from one laser passes through the rest of the light engine, the blue light from the other Laser strikes a yellow phosphor wheel, which, in turn, splits the blue light beam into red and green light beams. The newly created red and green light beams then join up with the still intact blue beam and pass through the rest of the light engine. One Epson LCD projector that uses a dual laser in combination with a phosphor is the LS10500. Laser/LED Hybrid (DLP)—Still another variation, that is used primarily by Casio in some of their DLP projectors, is the Laser/LED hybrid light engine. In this configuration, an LED produces the needed red light, while a Laser is used to produce blue light. A portion of the blue light beam is then split off into a green beam after striking a phosphor color wheel. The red, green, and blue light beams then pass through a condenser lens and reflect off of a DLP DMD chip, completing the image creation, which is then projected to a screen. One Casio projector with a Laser/LED Hybrid Light Engine is the XJ-F210WN. BenQ Blue Core LU9715 Laser Video Projector. Laser projectors provide the best combination of needed light, color preciseness, and energy efficiency for both cinema and home theater use. Lamps-based projectors still dominate, but the use of LED, LED/Laser, or Laser light sources is increasing. Lasers are currently used in a limited number of video projectors, so they will be the most expensive (Prices range from $1,500 to well over $3,000—also consider the cost of a screen, and in some cases, lenses). However, as availability increases and consumers buy more units, production costs will come down, resulting in lower-priced Laser projectors - also take into consideration the cost of replacing lamps vs not having to replace lasers. When choosing a video projector—no matter what type of light source it uses, needs to fit your room viewing environment, your budget, and the images need to be pleasing to you. One last point—Just as with "LED TV", the laser(s) in a projector don't produce the actual detail in the image but provide the light source that enables projectors to display full color-range images on a screen. However, it is easier just to use the term "Laser Projector" rather than "DLP or LCD video projector with a Laser Light Source".